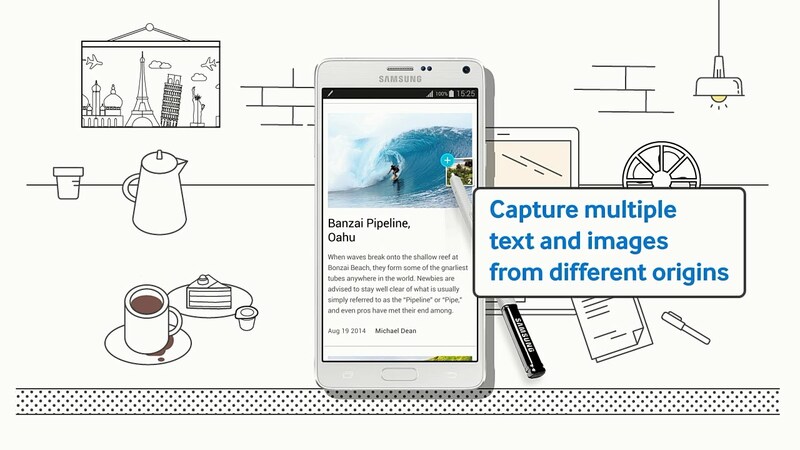 Samsung released a video this morning, detailing a few highlights of the S Pen found with the upcoming Galaxy Note 4. In the video, three key features are noted, those being Smart Select’s Capture and Share, Smart Select’s Link to Related Apps, and Photo Note. These features are not exactly new to the Note 4, but Samsung continues to refine their software offerings on each hardware update they release. With Capture and Share, users can highlight specific photos and text into one grouped folder, then share that folder through email or Hangouts with other parties. With Link to Related App, users can highlight specific data inside of one app, a date and location for example, then share that data through the Calendar app, allowing you to make plans even quicker than before. Finally, Photo Note will let you snap pictures of notes, say on a white board, and then convert that photo into an editable document. The example they provide in the video is quite smooth, and may actually be something you will use if you decide to pick one up. Will you be picking up the Galaxy Note 4 this month?